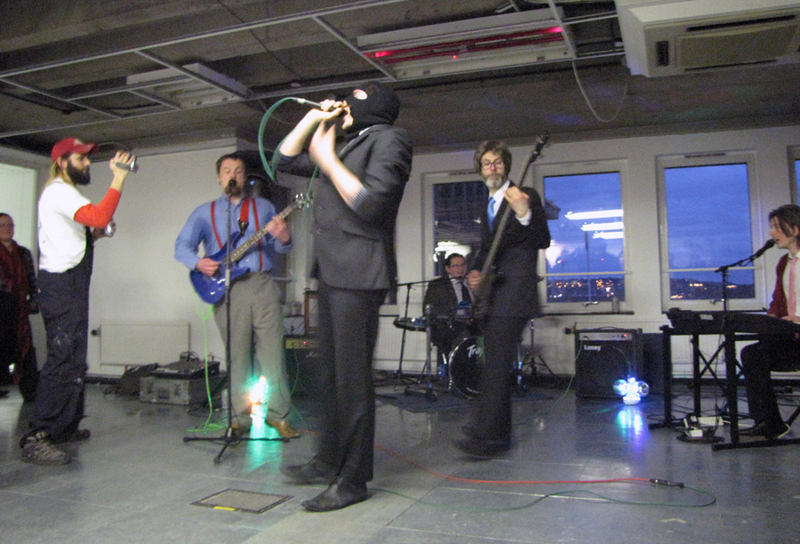 On 5th April 2013, Stabbing Les launched their first music video LES on Film at The Northern Charter’s project space. The event started with an alternative champagne reception (Veuve Olivier Sparkling Brut from Aldi) and screening of a music video LES on Film, followed by a musical performance by Stabbing Les. The theme of their performance was 80s excess, as satirised in the novel American Psycho (Bret Easton Ellis, 1991) and Mary Harron’s film adaptation (2000). LES on Film foregrounds the similarities between the cultural and political climates of today and of the 1980s. Shoulder pads and acid wash jeans are (ironically) fashionable, a Tory government is privatising public services and dividing the welfare state into “strivers and shirkers”; and the aesthetics and tastes of contemporary hipsterism so often constitute a refashioning of the emphasis on surface and image embodied by the 80s yuppie. Stabbing Les’s VHS music video launch seeks to highlight and encourage interrogation of these parallels. The Northern Charter was the perfect venue to stage this event because of its unique location in the heart of Newcastle and the stunning views over Pilgrim and Northumberland Street which are reminiscent of the urban landscapes seen in 1980s films such as Scarface (Brian de Palma, 1983).